Here’s a 1 percent no one wants to be part of: According to a recent analysis by Christopher Conover, a Duke University researcher on health policies and inequalities, barely 1 percent of the population accounts for nearly 20 percent of the nation’s already inflated health care spending. These few people each account for, on average, $115,000 in health care spending every year, which is almost three times the annual salary of the average American worker. 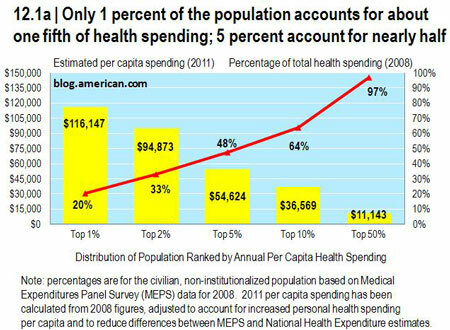 Only 5 percent of the population accounts for fully 50 percent of all the nation’s health care spending. Everybody else generates, on average, about $360 a year in health care costs, or about 3 percent.